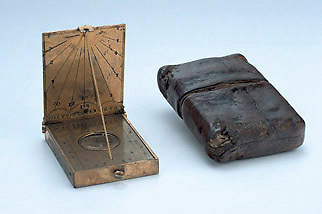 This string gnomon sundial has both horizontal and vertical hour lines and is made for a latitude of 47?. Its outer faces are decorated with engraved foliage, fruit, birds and animals. The instrument has a carrying case made of vellum and pasteboard covered in leather.